In fourth grade, students learn about Indiana History. The fourth graders at Winchester Village researched the Native American tribes who called the territory that later became Indiana and Ohio home. 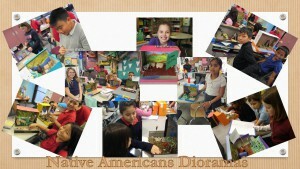 Students learned about the cultures, housing, clothing and trade of different tribes. 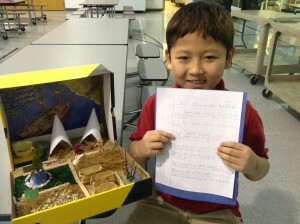 Students created dioramas demonstrating their new knowledge; they shared their knowledge with 2nd grade students. Students shown are (Left to right, top to bottom): Chloe Bryant, Biak Bawi, Melanie Balc, Tin Cun Lian, Cung Uk, Erin McKenna, Za Bawi Hu, Timothy Fowler, Jalon Harper, Jaskirat Mann, Mang Za Dim, Khup Khual, Ashley Telez-Garcia, Ro Hlu, Josselyn Estrada and Chloe Bryant (again).